The Coocoran opal fields consist of about 50 named opal fields are located about 21 kilometres east of the town of Lightning Ridge. 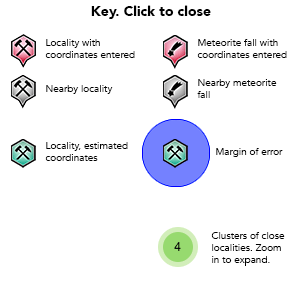 A "field" is an area where opal mineralisation has been found. Locally an opal field is known as a "rush" and is often named after the opal miner that initially found mineralisation in that area. On the Coocoran opal fields a rush can range in area from about 1 hectare up to more than 20 hectares. Peak production occurred in the period from late 1980s to late 1990s. 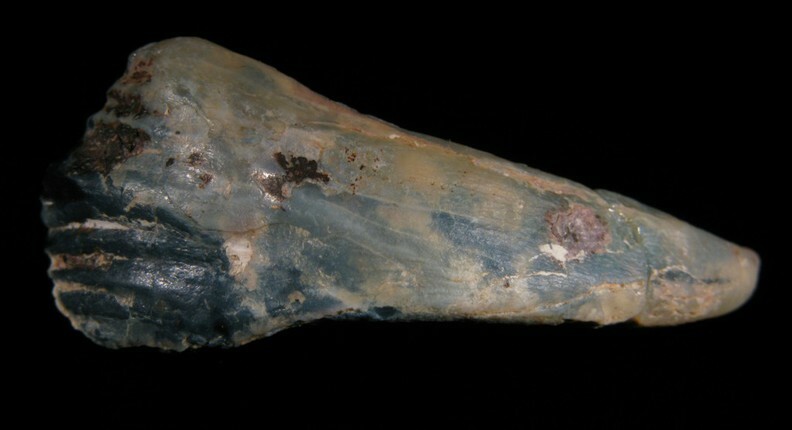 Underground and open cut mining techniques are used to extract opal from depths ranging from near surface up to 25 metres underground. The host rock is the Cretaceous Griman Creek Formation which is predominantly composed of freshwater (rarely estuarine?) claystones and sandstones. 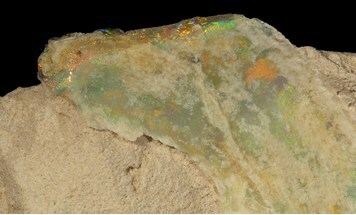 Most gem opal from the Coocoran opal fields is found as "nobby" opal. 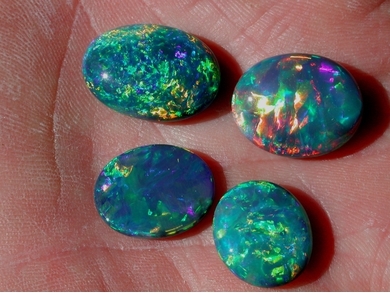 Nobby opal occurs as spheroidal or disc like pieces of opal that range from about 1 to 15cm in diameter sporadically distributed through claystone layers. 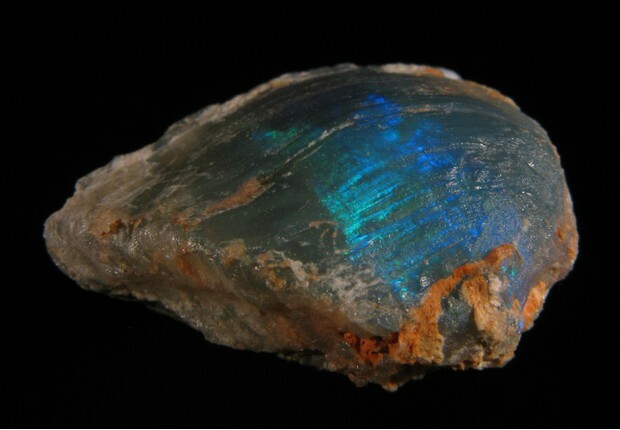 Opalised fossils also occur sporadically. Fossils include bivalve shells, gastropod shells, dinosaur bones & teeth, turtle shell & bones, crustacean gastroliths, plant stems & fruiting bodies, plesiosaur bones & teeth, monotreme bones, etc. 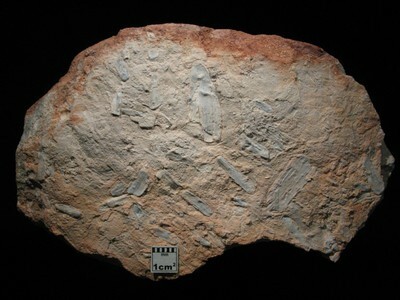 Reference: Cram, L. (2004): A Journey with Colour, Vol 2, Part B - A History of Lightning Ridge Opal 1873-2003, Len Cram. 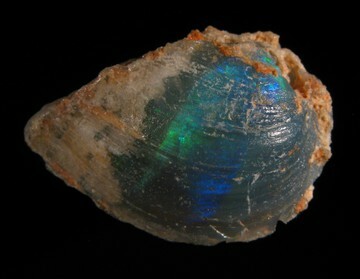 Description: Opal has typically replaced the shell of articulated freshwater bivalves, although in some cases the interior of the shell is also replaced with opal. In some cases the opal is all gem quality. Reference: - Smith, E. & R. (1999): Black Opal Fossils of Lightning Ridge - Treasures from the Rainbow Billabong, Kangaroo Press, East Roseville. Aracic, Stephen (1999), Rediscover Opals in Australia, published 1999 by the Kingswood Press. Smith, E. & R. (1999): Black Opal Fossils of Lightning Ridge - Treasures from the Rainbow Billabong, Kangaroo Press, East Roseville. Cram, L. (2004): A Journey with Colour, Vol 2, Part B - A History of Lightning Ridge Opal 1873-2003, Len Cram.